Well, continuing our watery theme, we’ve gently migrated from my occasional web geek tradition of Friday Cat Blogging, to Friday Lion’s Mane Blogging. Close enough. Especially if you’re in the water with these impressive and very beautiful jellyfish. They’re the largest of all jellies, and interestingly, also the longest animal, according to Wiki info. This one is about two feet across; a mere toddler. Once or twice a year I come across a small fleet of dying ones washed up on the pebbly sand at my beach, their deflated maroon bodies draping the shoreline like a ruffled bed sham. These guys can pack far more of a punch with their sting than my kitties can with their incessant yowling come breakfast time. Painful as that is when I just want to roll over and sleep, I’ll take that sound and the brush of their whiskers against my face over the silent sensation of a jelly’s tentacles against my leg, any day! I will never forget an amazing snorkeling adventure I had far off the coast of Placentia, Belize four years ago. 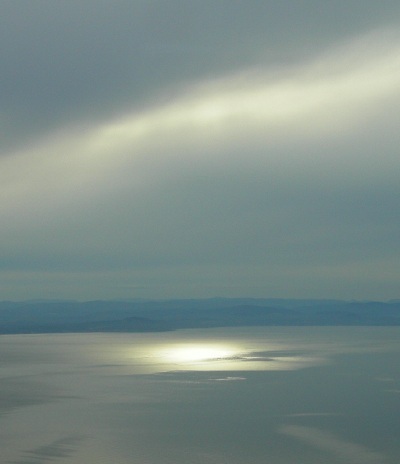 I had been deposited from a decrepit fishing boat twenty miles from shore into the warm open water. The nearest body of land was an atoll straight out of a comic strip: a dab of sand rising from the sea supporting one pathetically drooping palm tree and two coconuts. I expected to find a message in a bottle had I squinted. Wearing just a bathing suit, not a protective wetsuit, I floated happily in the salinity, swimming calmly in the middle of nowhere, intoxicated by the vivid reef and all its colorful life. Every hue of plants, coral and fish passed under my fins, including several barracuda. 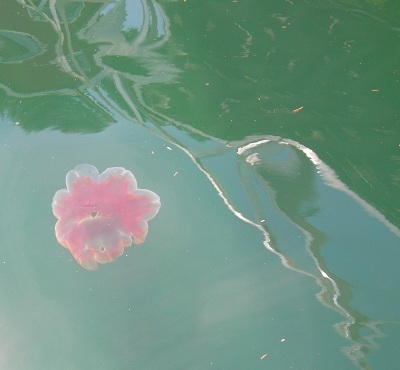 From time to time I’d glide past small translucent, vertically suspended egg-shaped jellyfish, maybe three or four inches long, which I had been assured did not sting. They looked reasonably harmless. Still, instinct being what it is, I made sure to zig and zag to avoid contact. As I continued to make my way, I noticed an increasing number of these alien-like creatures floating around me. Then very suddenly, the water became nearly gel-like. I looked straight ahead and was stunned to see an almost solid wall of tiny, to adult, egg-shaped jellies in front of me. I immediately looked to my right: another thick, gelatinous wall of baby jellies. More than slightly alarmed, I swiveled my head to the left: same thing. I was surrounded. There were millions of them. I had somehow gotten past the velvet rope and the bouncer, and entered a private club hosting a wild jelly-fest rave party. Ever see the flick, “Finding Nemo”? Remember the scene where they were forced to swim at high speed through a thick sea of menacing jellyfish, attempting to dodge the tentacles? Well, suddenly I became one of those cute animated Pixar clownfish as I took a breath, collected my resolve, and threw myself forward into the jelly muck with the optimistic assumption that surely at some point I would reach clear water on the other side. And I did. But not before enduring a few nagging nips and annoying stings from these ever-bobbing party animals. Turns out, the fellow who had told me that they didn’t sting… was wearing a wetsuit! To that which lies beyond. As promised prior to my departure last week, here are a couple of soothing views that accompanied me home from Seattle to Friday Harbor at day’s end yesterday. If ever there were proof of heaven on Earth, perhaps this is it. Or at least, the gateway to it. I sit here in my studio and am back in paradise, for sure. I followed this light homeward, to joy. A pal of mine from years ago, about my age and one of the kindest and most creative people I’ve ever met, just followed it to… someplace else. Awaiting me when I arrived home last night was a devastatingly sad email, telling me of a mutual friend’s sudden death a few days ago from a brain aneurysm. He leaves a wife who adored him, a three year old who will never know the utter joy of his Dad’s utter joy, and no doubt, many amazing ideas and projects that his gifted spirit has left permanently unfinished. Goodbye Niko, and may the light be as beautiful as you. 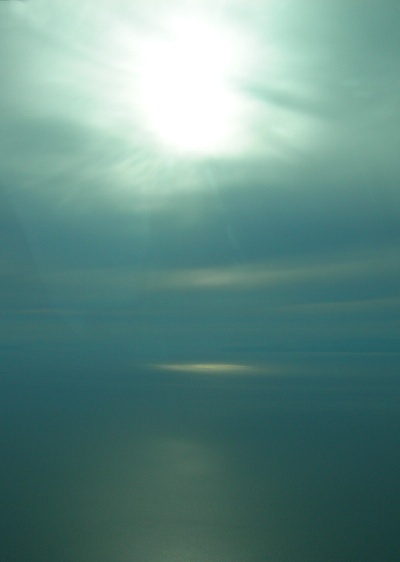 I’ll be off island this weekend, but back soon with more pix, including my favorite: those taken of this magical archipelago from inside the aeronautical equivalent of a Volkswagen bus at 1500 feet. No, wait: I’m hoping that my puddle jumper is considerably more aerodynamic than that! Greetings to all, and here’s to a great week ahead. With this special view, mine started yesterday (for those who think of the week beginning on Sunday. I’m of the Monday camp, myself). 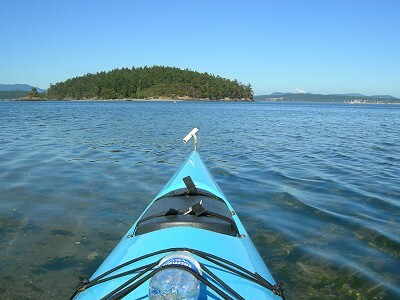 I kayaked out to what I gratefully refer to as my front yard, Turn Island, a wildlife refuge just steps and a few paddle strokes from my house. 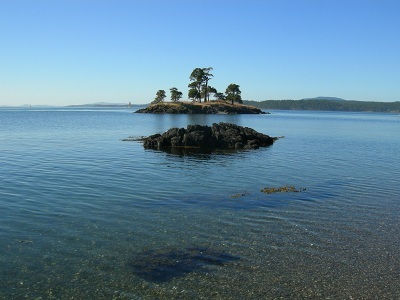 Above is a lovely succession of immersed kelp, a temporarily un-immersed outcropping, and a nearby atoll, as seen from Turn’s northwest shoreline. The air really smells like… air!… here, and the visuals in all directions are overwhelmingly distracting. Up: island after island, a dormant glacial ice-covered volcano, and a constantly shifting water surface on which some of the strongest currents in the world wreak havoc, stop, and then begin again. Down: clarity so stunning that you can’t help but stare into the depths as you silently glide over rocks and creatures on the sea floor. 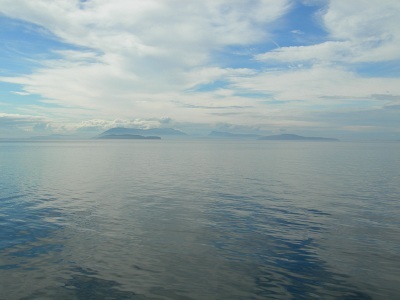 And for those who think the Pacific Northwest is only about clouds, take a gander at the solid blue. No color correction, folks. Gilligan would have loved it here. 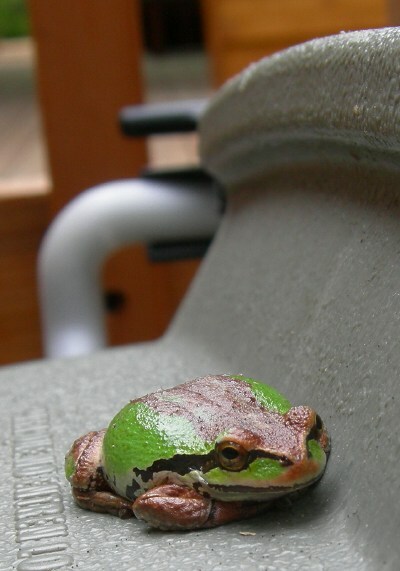 Ahhh…. a view out to the southeast and a couple of tiny private islands, with the snow-capped Olympic mountains (which my camera did not manage to capture) in the far distance toward the right. 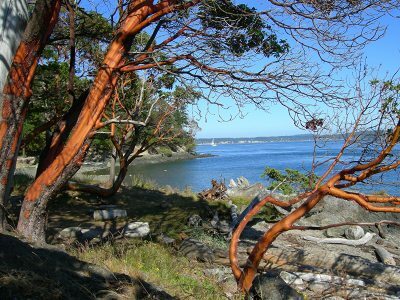 Groves of treasured Pacific Madrone, aka Arbutus trees, frame the view out to Lopez Island. If this isn’t enough to inspire more music as I finish my upcoming CD, Alextronica, I don’t know what is. The hardest part is making myself stay indoors in my studio! All those years in sunny So Cal meant taking glorious weather for granted, knowing you could get out any day you wanted. Up here, there’s a definite summer season. My temperament has always been one of seizing the moment and not letting opportunities slip by. So maybe my work will just go a tad slower than I had anticipated for the next couple of months, as I take full advantage of why I moved up here in the first place. Carpe Kayakum! There are times when I wish this were a “scratch ‘n’ sniff” blog. 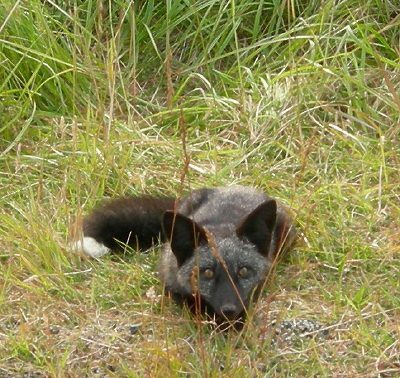 This is one of them. 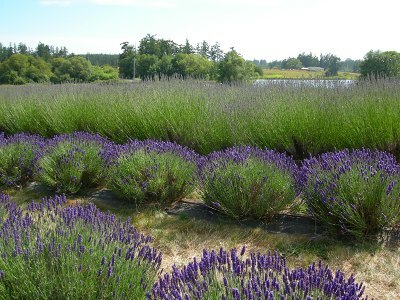 Lavender grows in easy abundance on the islands facing both sides of the U.S./Canada border. And with it comes the beauty of an aroma not only unique but, to me at least, intoxicating. 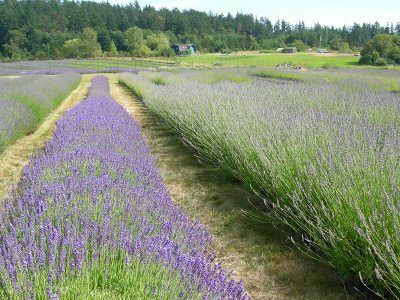 Add to that the vivid display of one of my all-time favorite color combinations, purple and green, and a July trip to the lavender farm when it’s in full bloom is a nearly psychedelic experience. Groooooovy! If I can make you just a little bit high gazing at these fields, then I’ve done a good deed for the day. 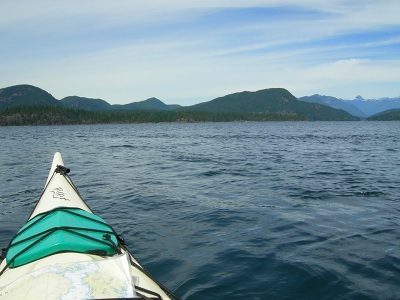 The view from the bow of my kayak in Surge Narrows Marine Park off Quadra Island, B.C. Need I say more? It was a great vacation! More soon, Kelphistos. We’re off tomorrow on an adventure in the northern part of the Salish Sea, to another collection of floating rocks known as British Columbia’s Discovery Islands. 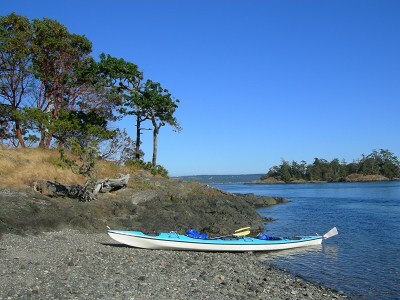 Quadra Island, specifically, is our destination, where we’ll meet up with three other couples who live part- or full time in Los Angeles, two of whom also have homes in these northern island latitudes. In the spirit of an ad hoc summer camp for music geeks and the laudable spouses who put up with us, kayaking, canoeing, lounging around, conversations both pithy and considerably less so, good food and an abundance (uh, probably an over-abundance) of decent red wine will fill the next few days. This is the first mini-vacation I’ve taken in quite a long time. Now, git yer score cards out: from San Juan Island, we’ll need to take a ferry jaunt at dawn in the wrong direction, to the east– to Fidalago Island– to catch a ferry going in the right direction– west, to Vancouver Island– in order to hop on yet a third ferry to Quadra, to the north, after driving up the eastern coast of Vancouver Island for about four hours, the first half hour of which requires driving… south, in order to go… north. 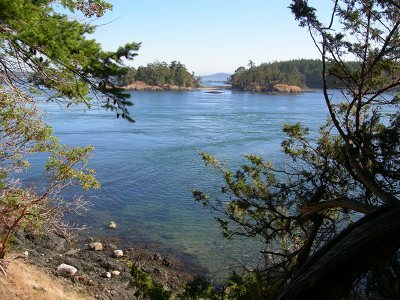 On our return in a few days, I’ll stop off at Saltspring Island (south of Quadra and north of San Juan) to see more music geek pals– yet another ferry, east and then west again!– while Charles drives and ferries south to Island Home Base. 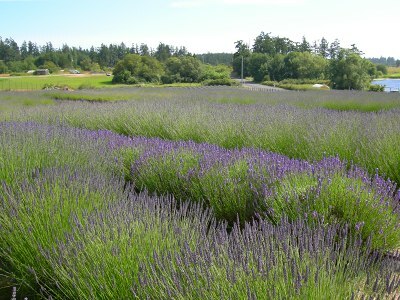 From Saltspring I can make it by foot, bus and ferry back home on Sunday. Catch all that? Good, because I barely can. I’m dizzy just typing it. Above is an example of the kind of rhythm that separates those of us who are quite happy living on a remote, bridge-less island, from those who would prefer instantaneous proximity to all that mankind has to offer. Ferry and plane schedules are limited and weather-dependent, requiring a good dose of back-timing and a larger one of patience. There are relatively few flights and boats per day. There’s often a day or two in winter when one simply can’t get off the island due to inclement conditions (unless you are voted off, in which case, into the drink ya go, deservedly). And conversely, there are days in the summer when it seems as though everyone is either getting off of, or getting on to these islands, and the wait time in the ferry line is several intrepid hours. Most of all, the concept of having to use highly circuitous routes that take the better part of an entire day, in order to traverse distances one might span in a car on the mainland in an hour or two, is a tad absurd at first. But it quickly becomes second nature, and only when I describe to visiting friends how to get here, am I reminded just how tricky getting here sometimes is. I’m guessing that the powers that be are laughing, since they clearly planned it this way to keep out the riff raff. Well, despite their best efforts, I snuck through anyway, and I’m just so glad that I did. And, I am very thankful that there is no bridge, and with luck, never will be. Sometimes extraordinary beauty and peace should be earned. Besides, it’s hard to think of any of this as being inconvenient when the view from the ferries are the images you see here! A world of magic just beyond your toes. Shortly prior to calling this piece of floating rock “home,” I visited the particular spot pictured above. This very table, as I recall. It’s on the west side of the island and is located in a state park known best of all for being a great whale watching vantage point. On the quick path to the sea, I remember passing a simple sign that officially informed, “Whale Watching,” adding a directional arrow for emphasis. Why anyone would look for a whale in a direction other than the water is a mystery to me, but the nice people who run these parks are nothing if not thorough. You see signs like this all the time, and think of them more like a pleasant idea rather than a declaration of fact. 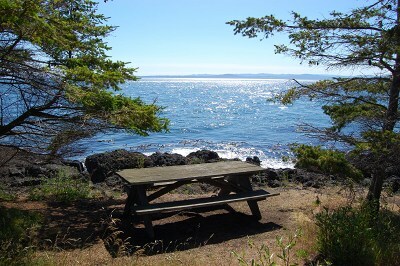 I walked a few yards past the sign to this table, looked up, and lo and behold, right on cue for their cameo montage segment right out of an Esther Williams movie, were about 18 Orca whales close to the shore. Truth in advertising. First shot outta the box. I have yet to repeat that experience. With or without cetaceans, this is a gorgeous spot and I seem to end up here with virtually every island visitor I’ve had, which is becoming a mounting number. Not one other time have I seen so much as a sea slug, let alone a whale. But it doesn’t matter. The Orca pods move around, I move around, and sooner or later we will all find ourselves facing each other once more on a shoreline. I will be enthralled. They will not care in the least. As it should be.